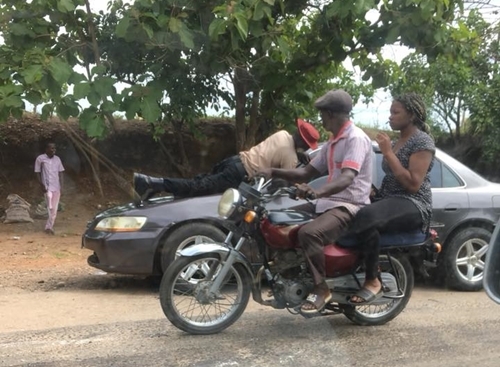 An overzealous FRSC officer has been spotted as he jumped on top of a moving vehicle after the motorist reportedly refused to stop at a checkpoint. An official of the Federal Road Safety Corps (FRSC) has been captured on camera embarrassing himself while trying to stop a ‘stubborn’ motorist in Nasarawa State. 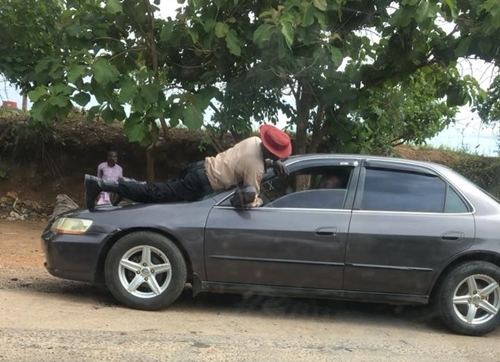 Photos which emerged on social media and are making the rounds online show the FRSC official as he climbed on the moving vehicle in order to stop the driver who refused to halt his vehicle at the checkpoint. An eyewitness, Torkuma Gabriel who took pictures of the officer in action revealed that the incident happened in front of Nasarawa State University in Keffi.